This review originally ran on DVDTalk.com in 2011. 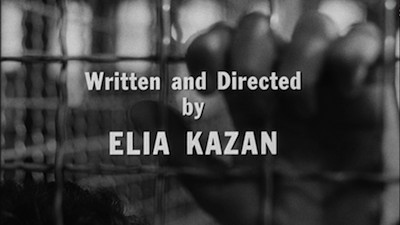 Elia Kazan had already had a long and distinguished--and oft controversial--career in both theatre and cinema by the time he made his most personal film, America America, in 1964. Known for making pictures that pushed the envelope in terms of subject matter, be it challenging moral taboos or exploring socially conscious issues, the filmmaker didn't necessarily abandon those things for his immigration epic, but he found a way to make them more directly about himself and where he came from. America America is, at its core, a family story. 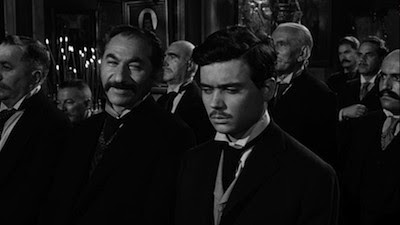 Kazan wrote it as a tribute to his uncle, first in a book and then as this screenplay. Said uncle emigrated from Turkey to the United States in the early 20th century. The cinematic version starts out in 1896. Stavros Topouzoglou (newcomer Stathis Giallelis) is the eldest son in a poor Greek family living in the Anatolian Mountains. As Kazan tells us himself in an introductory voiceover, the area was known for a large Greek and Armenian population when the Turks moved in and took over. At the time of the story, both groups live under occupied rule, and recent Armenian activity has caused an ethnic crackdown. Though Stavros is Greek, he can't avoid being caught up in the unrest. He is business partners with the Armenian worker Vartan (Frank Wolff). They go into the woods together and get ice to sell back down in the village. They both dream of someday leaving Turkey and sailing the Atlantic to find new opportunities in the States. Pinning their hopes on Stavros and with fingers crossed it might keep him from jail (or worse), the Topouzoglou family sends him to Constantinople with all of their valuable possessions and traditions. The plan is for him to join his uncle's business there and slowly bring the rest of the clan along once he starts making money. On his trek, he meets an opportunistic Turk (Lou Antonio) who chisels him out of all his goods, setting off a chain of events that puts the young boy way off course. Unable to take up with his uncle, he ends up on the streets trying to make his fortune, only to continually lose what little he makes, run afoul of violence, and generally screw up. The other men call him "America America" because that's all he can talk about--one day getting enough cash to go to the Land of Opportunity. Unlike most immigrant stories, Kazan isn't concerned with what happens once Stavros finally gets overseas. This is the story of the long and difficult process of escape. America isn't a reality, it's a fantasy, an image in advertisements and on postcards. Stavros doesn't have a dream of doing anything when he gets there, his dream is just getting there. Opportunity will be opportunity, it doesn't matter what it is. Kazan shot most of America America on location overseas. 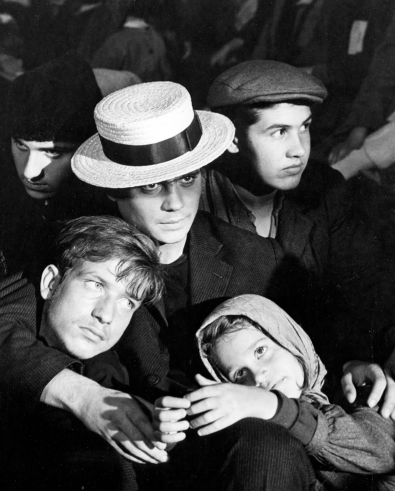 Though many of his previous films brought a new social realism into American cinema, as well as a new kind of performance--he worked with both Marlon Brando and James Dean, who became icons of method acting--America America has more in common with Italian Neorealists than it does A Streetcar Named Desire. Working with mostly unknown, untested talent, he was able to create a film that is grounded in naturalism, even as the script toys with more traditional storytelling, including the oral tradition that allowed family stories of this kind to be passed on from generation to generation. Haskell Wexler's amazing black-and-white photography presents the harsh life without any varnish. 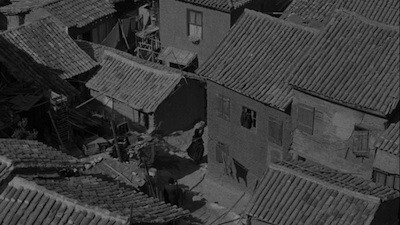 The sets and locations can be majestic and elaborate, yet the poverty is evident. Most of the settings are broken down, and people live on top of one another. Likewise, the costumes are torn and dirty. We can see the effects homelessness has on Stavros. By contrast, glimpses of the finer side of life seem almost contrived. An American that Stavros briefly encounters looks like he pulled his immaculate period suit straight out of studio wardrobe. When Stavros joins a wealthy family, their life also looks like costume drama put together by a vast production team. Don't take that as a criticism. 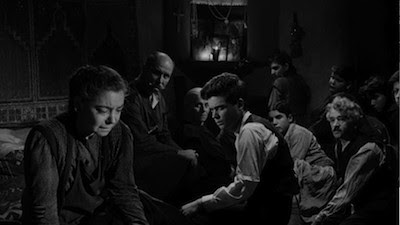 I think this was intentional on Kazan's part, he wanted to show how deep the divide between the classes and how unreal the reality of the upper crust could be. These finer things are just another temptation to Stavros, and temptation is just a distraction. Also, short cuts are a danger. Surprisingly (or maybe not so), women prove to be the key to a lot of his actual success--and fittingly, the actresses in the movie stand out. Linda Marsh is heartbreaking as Stavros' understanding and long-suffering spouse, and Katharine Balfour draws pity in a whole other way as a sheltered American wife. Ultimately, though, Stavros' path to success is reliant entirely on him. He must maintain focus and never waver from his goal. In this, America America is both a cautionary tale and statement of hope. One must never forget the struggles and sacrifice of those who have journeyed to the States in search of a better life, and how that goes deep down to the core of what the country stands for and what it was founded on. The actual achievement is not a fairy tale, it is not always clean or even honest, but the impulse to be a part of the great experiment is always worthy of tribute.